There’s something about Pisceans in power that doesn’t sit comfortably. The country and it’s people want stability and consistency but the Piscean character provides neither. It is the last sign of the zodiac and it’s job is to take all of the experiences of the other 11 signs and to dissolve and disperse them in order for a new start to begin in Aries. In the natural world the early spring rains come to soften the hard solid ground of winter. Pisces is the most fluid of all signs, it’s purpose is adaptability and flexibility, it is as hard to pin down as a flowing river. It’s not that Piscean rulers deliberately do things that cause problems, but there will often be a sense of uncertainty and even a feeling that the crown itself could dissolve away. 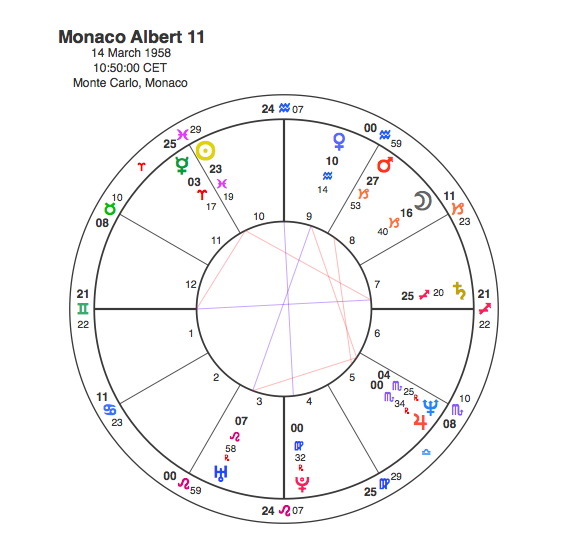 Prince Albert of Monaco has the Sun in Pisces in the 10th house. The 10th house is the place of career and social status so the Sun in 10th is a good position for a monarch. His Sun, however is in exact square aspect to Saturn in the 7th house. Saturn is the principle of limitation and in square to the Sun it brings obstructions and frustrations. As Saturn is in the 7th house, these problems would be centred around his marriage. Albert was the son of Prince Rainier and Princess Grace. He succeeded to the Principality at the age of 47, but the concern amongst many Monegasques was that he was unmarried and had no children. This in itself is a clear example of the Sun in the 10th house in aspect to Saturn in the 7th, but the concern amongst his subjects was considerably enhanced by a long standing agreement with France where if the ruler of Monaco died with no heir, the principality would revert to French control. The Monaco dynasty is one if the richest in the world and Albert like many of his predecessors lived a high life and had a string of relationships with movie stars and others. This did not stop worries about his not being married and many people wondered if he was gay. The big concern was the succession and his lack of an heir. One of the Sun’s symbolic rulerships is over one’s children and the Sun square Saturn often brings problems in this regard. There may be no children or some kind of problem with the health of the first child. The Sun in Pisces in the 10th square Saturn in the 7th very neatly symbolises the situation of a ruler ( Sun / 10th ) that is causing uncertainty ( Pisces ) through his lack of children ( square to Saturn ) and marriage ( 7th house ). Prince Rainier died in 2005 and Albert succeeded to the Principality. Within months of his accession, it was confirmed that he did have an illegitimate child through one of his previous relationships. This did not solve the succession problem as only legitimate heirs would count but it did change people’s perceptions of Albert and also gave him a lot of difficult press to deal with in the early period of his rule. 2005 was obviously the watershed year in his life and needless to say Pluto was in square to his Sun and conjunct the 7th house Saturn at the time. Albert did actually marry in 2011 but has no legitimate heirs to date although another child born out of wedlock has been confirmed. In recent years an agreement has been signed with the French which allows the succession to pass to Albert’s sister in the event of him dying with no heirs. On another note Albert has the Moon and Mars in the 8th house. Princess Grace, his mother died in a car crash. The Moon rules the mother, Mars rules driving and the 8th house rules death. Pluto was square Albert’s Mars in 1982 when she died. Prince Albert’s chart clearly shows the issues that concerned the Principality. Pluto brought him to the throne and these issues to the fore.